However, after Fed Chairman Volcker raised interest rates to double-digits, the price of oil, gold, and silver plummeted over the next two decades. And by 1999, the Dow Jones-Oil Ratio surged to a high of 534.The high Dow Jones-Oil Rato came as a result of a low $19.34 oil price versus the Dow Jones Index average reaching a new high of 10,339 in 1999. Now, let's explore what has occurred more recently. 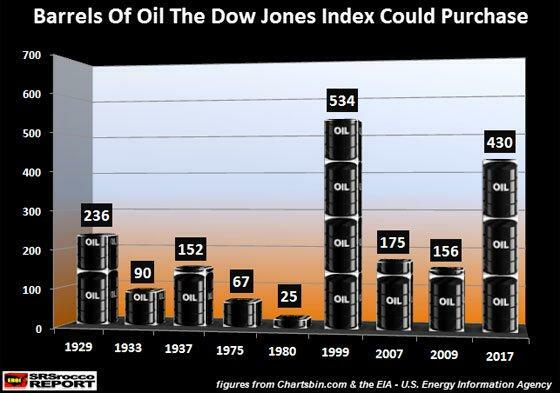 As the price of oil increased from 1999 to 2007, the Dow Jones-Oil ratio declined to 175, even though the market reached a new high of 14,200 points. 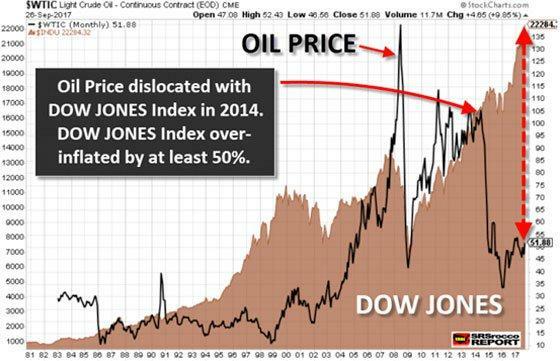 Furthermore, during the first quarter of 2009 when the stock market collapsed to a low of 6,500, and the oil price fell to $42, the Dow Jones-Oil Ratio only declined to 155… 20 barrels less than at the peak in 2007. The peaks and valleys in the Shiller PE Ratio chart correspond to the highs and lows in the Dow Jones-Oil Ratio chart. For example, the Shiller PE Ratio reached the first high of 30 in 1929, as the Dow Jones-Oil Ratio was 236, but both indicators fell to a low in the early 1980's. 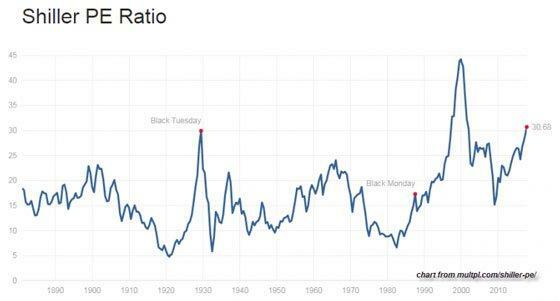 Lastly, the Shiller PE Ratio in 1999 and today correspond to the peaks in Dow Jones-Oil Ratio as well. 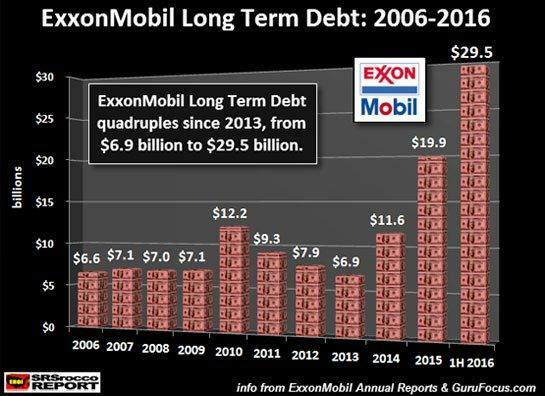 With the price of oil at $19.34 in 1999, Exxon Mobil was still able to enjoy positive $1.84 billion in U.S. upstream earnings versus a loss of $4.15 billion in 2016, based on a $43.29 oil price. Upstream earnings represent the profits Exxon Mobil made from its U.S. oil and gas fields. So, even with an oil price of $19, less than half of what it was last year, Exxon Mobil still made profitable earnings in 1999 on its U.S. oil and gas fields. 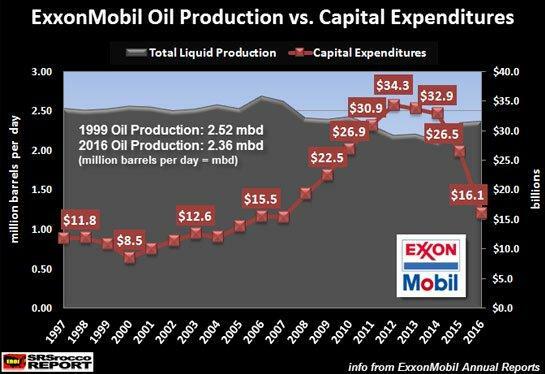 As the price of oil fell from over $100 a barrel in 2014 to $43 in 2016, Exxon Mobil slashed its capital expenditures in half from $33 billion to $16 billion. By severely cutting its capital expenditures, future oil production at Exxon Mobil has only one way to go…and that's down. Now, what I have shown here is a deteriorating financial situation at the largest and most profitable oil company in the United States. Exxon Mobil is the biggest and is supposed, the best of the best. So, can you imagine what is taking place in the marginal U.S. shale oil companies? Yes, it's a fricken disaster. In conclusion, the Dow Jones Index is currently overvalued by orders of magnitude we have never seen before. The only thing propping up the stock market and the economy is the Fed and Central Bank money printing and asset purchases. Moreover, there are trillions of dollars in currency swaps that aren't even included that make a bad situation even worse. For the precious metals investors who are disillusioned by a stock market that continues to rise towards the heavens while the gold and silver prices remain in the doldrums, you have my sympathies. However, fundamentals and the truth always win out in the end. Although, it has been quite difficult to follow an investment strategy based on ethics and integrity it seems that many people today believe it is okay to sell one's soul or integrity to make a buck.